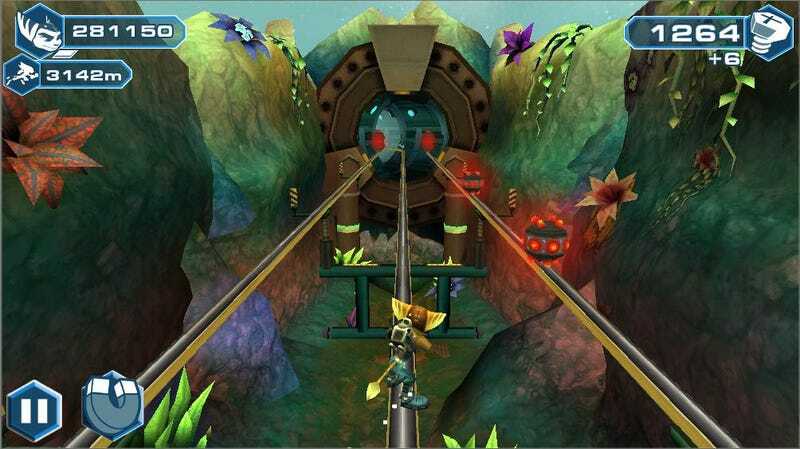 There's a Ratchet & Clank Endless Runner for Mobile. Huh. It's called Before the Nexus, and is sort of a prequel to the Ratchet & Clank game released last month for PS3. BtN popped up on iTunes and Google Play recently, with very little fanfare (I guess the game descriptions are fairly enthusiastic). You jump between grindrails, dodging obstacles and ruining enemies' day along the way. Standard endless runner fare. You also collect Raritanium, which can by synced to your PSN account to be used in Into the Nexus to buy upgrades with.